Common errors, and errata in recent publications and websites regarding Oskar Fischinger and Visual Music. Plus a few curiosities and notes. In our field, we see many of the same errors repeated continually in papers, essays, dissertations and books. Other errors noted below are new, with some rather bizarre fiction. We hope that this resource will encourage and assist more accurate scholarship in the field of Visual Music. Rogers, Holly and Jeremy Barham, eds. The Music and Sound of Experimental Film. Oxford University Press, 2017. --Introduction, pages 3 and 21. Date error in title of book cited, should correctly be: Oskar Fischinger (1900-1967): Experiments in Cinematic Abstraction. --Introduction, page 5, re Mary Ellen Bute's "series of abstract shorts, Seeing Sound (1930s to mid-'50s)." Note that Bute did not make these films in the 1950s. --Introduction, page 7, re Fischinger's "technique of drawing on the optical soundtrack of the film strip to produce direct sound..." Fischinger did not actually draw on the soundtrack, but prepared drawn objects which he photographed, then printed on the soundtrack area for his Ornament Sound experiments of the early 1930s. --Bibliography, page 21, error re William Moritz's Optical Poetry biography of Fischinger - this was published by John Libbey Publishing: Eastleigh, UK, 2004. --Page 25, Daniels, Dieter, Absolute Sounding Images. Author states that by the end of the 1920s Oskar Fischinger, among others, "played a significant part in the development of" two art forms, "abstract film and radio drama," but gives no source or supporting information. CVM is unaware of any involvement by Fischinger in the development of radio drama (nor does his archive of papers, texts, essays and clippings reflect this), nor has this been previously published by Fischinger's biographer or others. Harvey, Doug. CVM DVD review in Artillery magazine, 2017. Extensive factual errors. Among them, another company besides CVM is credited for distributing and promoting Oskar Fischinger's films over the last 15 years, which is false. There is not another "Los Angeles based" company which holds any rights to Fischinger's films, nor has there been for many years. Hong, Leon, Google. Oskar Fischinger's 117th Birthday. June 22, 2017. Hong states that Fischinger "spent months — sometimes years — planning and handcrafting his animations." Though months is correct, Fischinger didn't spent years making an individual animated film. Unfortunately this error has been picked up and repeated in dozens of publications worldwide. The Telegraph (UK), Who was Oskar Fischinger? (June, 2017) states, "His impeccably-created stop-motion animations, synchronised to music, were a painstaking endeavour that he would obsess over for months or years." See above re claim of years; also, Fischinger made only a few actual stop-motion animated films including Composition in Blue, An Optical Poem and the Muratti ads. This term does not accurately describe the vast majority of his films, many of which were made with animation drawings, cels and other animation techniques. Still from An Optical Poem, scanned from 16mm print from Fischinger Archive collection at CVM, showing more accurate colors than the faded versions on youtube. Maya Oppenheim, Independent. Oskar Fischinger: Pioneering animator's most psychedelic films. We'll pass over the use of "psychedelic" here to the subtitle which states he "worked on some of his animations for months or even years." See above. Article uses a large, poor quality, faded still from An Optical Poem (ripped from youtube). -Author continues, "Fischinger trained as a violinist and organ-builder before taking up an interest in film and relocating to Berlin..." however Fischinger first moved to Munich where he spent several years making films, before moving to Berlin. -"Before long, the animator, who was born near Frankfurt in 1990, was contributing sequences to Walt Disney's Fantasia and Pinocchio from his Paramount Pictures office." That should be 1900, not 1990, and he didn't work on Disney films from his Paramount office! See above. Sophie Curtis, MIRROR. Who was Oskar Fischinger?.... "Oskar Fischinger, the artist best know for his work in motion graphics and animation" NOTE: Very early motion graphics, perhaps. Author states Fischinger "began making abstract films while living in Frankfurt in 1924," but it was actually 1920 or 1921. Same error as stated above re spending years on an animation. Open Culture. Optical Poems by Oskar Fischinger, the Avant-Garde Animator Hated by Hitler, Dissed by Disney. (September 2014). No explanation or evidence included as to why the author believes Hitler even knew Fischinger, let alone hated him. Article also states, "in the 1930s, he moved to Berlin," note that the correct year is 1927. Award for the most ridiculous statement in a title: Adrian Seale, The Guardian, Oskar Fischinger: The animation wizard who angered Walt Disney and the Nazis (January 9, 2013). Author does not provide any evidence or explanation as to why he thinks Fischinger angered Walt Disney (nor have any others). He writes, "His art was classed as degenerate by the Nazis," but all abstract art (not specifically Fischinger's work) at that time had been declared degenerate. Author states, "Motion Picture No 1 was the last film he made," but this is incorrect, he made several advertising films after that time; and the actual name of that film is Motion Painting no. 1 (aka Motion Painting I), not "Picture." --Filmography, page 228, re Euthymol Commercial, the correct date of the Moritz recreation on videotape is 2000. Sito, Tom. Moving Innovation: A History of Computer Animation. MIT Press, 2013. Contains errata on Fischinger, Hy Hirsh, and other abstract filmmakers. Zinman, Gregory. "Analog Circuit Palettes, Cathode Ray Canvases: Digital's Analog, Experimental Past" in Film History, 2012. Exchange and Evolution: Worldwide Video Long Beach 1974-1980. Huffman, Kathy Rae, ed. Long Beach Museum of Art, 2011. Frank, Peter. MidCentury Modernists in LA Weekly, 8/22/07. Radical Light: Alternative Film & Video in the San Francisco Bay Area, 1945-2000. Anker, Geritz and Seid, Eds. A number of early Moritz articles placed online at various sites contain incorrect information, not only on Fischinger but Belson, Hirsh and other artists; a few of these articles are mistitled or are actually drafts, not finished versions. See CVM's online Library for annotated versions with corrected/updated information. Neither John Whitney nor Jordan Belson worked on or contributed film to the Hollywood feature film 2001: A Space Odyssey. The slit-scan technique used in this film was however copied from Whitney's work and techniques (without his collaboration). Whitney's slit-scan effect can be seen in the long version of his film Catalog. James Whitney did not use computers to make his film Yantra. It was hand-made; read about it here. About Lapis and John Whitney's early computer animation, William Moritz discusses here. Jacobs and Belson's Vortex Concerts. There weren't 100 Vortex Concerts, or 62 or 60, as often printed, according to Jordan Belson, who stated there were far fewer. From Keefer, Cindy: "Cosmic Cinema and The Vortex Concerts." Cosmos: The Search for the Origins, from Kupka to Kubrick. Arnauld Pierre, Ed. Madrid:El Umbral/Santa Cruz de Tenerife:TEA, 2008): Page 361 and 475, Footnote 1: "In May 2008, Belson remembers there were only a few dozen Concerts. No documentation has been found to support the statements of “over 100 concerts” which appear in many texts. From existing documentation today it is possible to verify around 35 concerts, including Brussels...Many texts refer to “over 100” concerts though in 1967 Sheldon Renan writes of 62...However, Belson does not support the accounts of “over 100” or 60, nor do available documents and program notes from the era." The Vortex Concerts were held in 1957-1959, not 1960 as often printed (Source: Numerous papers, programs, clippings and press in the Belson Collection at CVM and elsewhere). The films Allures, Yantra and Eneri were not screened at Vortex, only a brief manipulated fragment from an early version of Yantra was used. Interference projector patterns filmed for Vortex were later used in Allures (Source: Jordan Belson; for an in-depth essay regarding Vortex and these films, see Keefer, Cindy. "Cosmic Cinema and The Vortex Concerts," cited above). For a bibliography of articles on Vortex plus other resources, please visit CVM’s Belson Research pages. CVM has recently restored one of Belson's Vortex 5 presentation reels containing brief Hirsh oscilloscope patterns and the manipulated fragments from the early version of Yantra. Hy Hirsh's name is not spelled with a "c." Source: Hirsh's stamps on his photographs and credits on his films. Various statements referring to Fischinger's "hand painted films." Fischinger did not make hand painted films, but Harry Smith did and titled one of them "Circular Tensions - Homage to Oskar Fischinger." Thanks to the potential of repeated viral inaccuracy on youtube, a clip of the Harry Smith film placed on youtube has often been spread, posted on blogs and attributed as a hand-painted film by Oskar Fischinger. 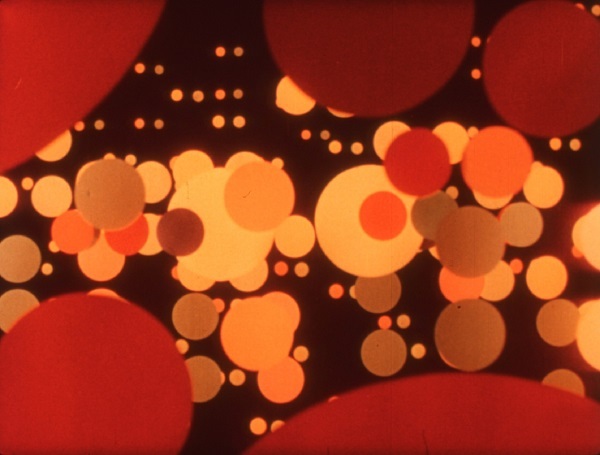 We do want to mention there were a very few hand-tinted shots in Fischinger's early 1920s experiments, but he did not make any actual "hand painted films." Fischinger was not fired from Paramount or Disney (See Moritz, Optical Poetry; and Fischinger's Paramount resignation letter). Richter, Hans. "A History of the Avantgarde" in Art in Cinema, Frank Stauffacher, Ed., San Francisco, 1946. Contains extensive errors. Richter's film Rhythm 21 was not completed or screened in 1921 (see Jeanpaul Goergen, Hans Richter. Film ist Rhythmus, Berlin, July 2003. Available at Arsenal, Berlin). Richter has pushed the start dates in Art in Cinema of Ruttmann and Fischinger's films to later dates. Ruttmann's Opus 1 was 1921. Fischinger did not start as a painter as Richter writes, and he started making abstract films well before 1929. See the Fischinger Research pages for an Excerpt from 1947 text by Fischinger correcting this account. As Goergen has explained to CVM via email, “The only film by Richter that passed the German censorship and was shown officially and in public was a film called "Film ist Rhythmus" (not preserved under this title) presented at the second screening of the matinee "Der absolute Film" in Berlin, 10. 5. 1925.” Thus the claims of 1921 or 1923 for a Richter film are incorrect. It may even be finally in 1951 that these early Rhythm films were edited and released, according to Goergen. Moritz, William. “Hy Hirsh and the Fifties” (2001). Re James Whitney and Hy Hirsh. James Whitney’s film Yantra was not screened by Belson, or synchronized to music, at Morrison Planetarium during a Vortex Concert. At a separate, later 1959 event at the San Francisco Museum of Art called "Vortex Presents," Belson did screen Yantra, which was first synchronized then with an excerpt from the “Cain and Abel” soundtrack (Source: Belson interviews, Belson correspondence and "Vortex Presents" program). Re the Hy Hirsh funeral story here - Interviews with Hy Hirsh’s friends from his final Paris years have revealed that Moritz’s story about the many lovers showing up at Hirsh’s funeral, and inspiring a Bergman film, has no basis in fact. Note that Moritz’s texts for the 1990s Absolut Panushka site also contain similar, numerous Vortex, Belson and Whitney errors. Many of Moritz's earlier visual music-related articles (especially from the 1970s - 90s) contain errata which he later corrected after additional research, or which were later found to be incorrect. Beware early non-annotated Moritz articles online at various sites. Some are even online with incorrect titles and publication citations; a few early drafts containing errors are also presented online as final published articles. It was Moritz's wish that not all of these early articles be placed online. We have begun annotating his articles, starting with some significant errors - visit our online library. Page 215. Lukach writes that Fischinger's "most-acclaimed film, Motion Painting No. 1" is a film without music. Correction: this film does have music, by Bach. Absolut Panushka online project, William Moritz texts. Numerous errors, notes coming soon. Los Angeles Filmforum, Alternative Projections website. A project funded by The Getty for Pacific Standard Time. Contains numerous errors regarding Oskar Fischinger, Jordan Belson, William Moritz, Hy Hirsh and their individual films. Extensive use of inaccurate information from decades-old sources. Examples below. --Films section. "Circles" by Oskar Fischinger. Kreise (Circles), correct date is 1933-34 (several different dates are given in this listing). This film was not "the first color abstract film ever made" as stated here. It was one of the first color films made in Europe. Time given is incorrect, this film is almost 2 minutes in length, not 1 as stated. --Films section. Most of the running times given for Fischinger's films are incorrect. For example, Motion Painting no. 1 is an 11 minute film. Studie nr 8 is not 6 minutes, but 5 minutes. Many of the dates are also incorrect. Titlles of the Studies are incorrect; Fischinger did not use hashtags in the titles of his films. --Films section. Composition in Blue listing. Two different dates are given. This film was made in 1935, not 1933. Re the statement here "This is one of the first abstract color films ever made," this is confused with a statement made about Kreise, made in 1933-34. Many other color films were made before 1935. --Films section. R-1 ein Formspiel is the title of a re-creation made in 35mm Cinemascope by William Moritz in 1993. It is unclear if Fischinger ever used this title for his multiple projector performances, which were in 35mm. --Films section. Radio Dynamics was originally made in 35mm. 35mm prints are still distributed today, as well as 16mm. --Films section. The film Studie nr 5 was made in 1930, not 1928 as stated here. Correct length is 3:15 minutes, not 6. --Films section. Studie nr 6 was made in 1930, not 1929. Length is given as 6 minutes, but the correct length is 2 minutes. --Films section. Though credited to him here, Hy Hirsh did not make a film called Mad Nest. Nor did he make an 8 minute film titled Recherche in 1961, as stated. Re his film Come Closer, it is incorrect that it was a computer film. While Hirsh did film some oscilloscope patterns, he did not use a computer to make this film in 1953 (2 different dates are given on this same page for the film). For correct data, see Hirsh's own CV and filmography. --Hy Hirsh biography - incorrect on numerous points. No evidence of employment in Spain has been found by those researching Hirsh over the last 5 decades (Moritz, Keefer, Reid etc.). --Jordan Belson Filmography. The film High Voltage was not directed by Belson and James Whitney. --Organizations section. Neglects to list the Visual Music Alliance, which is the oldest organization devoted to Visual Music. Many of the corrections have been sent to LA Filmforum, several times, from 2011-2015. Oskar Fischinger entry. Fischinger was not from Munich as stated, but from Gelnhausen, a village near Frankfurt. Described here as a "tinkerer," Fischinger was actually a trained engineer who invented numerous machines and equipment, patenting several during his lifetime. Fischinger's film An Optical Poem was made in 1937, not 1938 as stated here. Clarification. Zinman writes, Single Wing Turquoise Bird "were students of fellow West Coast abstract filmmakers Belson, the Whitneys, and Fischinger." The members of SWTB light show group were colleagues of the Whitneys, and some were friends, but were not tutored by the Whitneys. Belson lived in San Francisco and had little contact with SWTB members. Fischinger did not tutor any of them, though he lived in the same city. The use of the phrase "were students of" is somewhat misleading when referring to contemporaries living in the same city. IMDB - errors too numerous to list. Not a reliable source for many visual music filmmakers. Wikipedia also contains numerous errors. Youtube - Extensive errata. We don't know where to start, there are too many. -Videos of Fischinger's An Optical Poem on youtube. These are faded versions; the yellow layer of this film appears to be gone. This film has rich yellows, browns, oranges which are not visible in these degraded online clips. Dates are usually incorrect as well. --Hy Hirsh films on youtube. The long-standing "official distributors" are not acknowledged here as distributors- LUX London and Light Cone, Paris. The new head credit placed here on Come Closer, "copyright 1952 Creative Film Society" is not accurate; Hirsh was still alive in 1952 and had not given his copyrights to anyone, including a company not yet formed. Similar errors for Scratch Pad (1960) and Chasses des Touches (1959); Hirsh was still alive and held his own copyrights at that time. --A Harry Smith film on youtube, Homage to Oskar Fischinger, is often mistakenly credited to Fischinger.